The hryvnia lost 34 percent against the US dollar after the head of the central bank signaled it can no longer support the currency with regular interventions and will allow greater fluctuations. The hyrvnia hit a historic low of 24.5 per 1 USD. “Get used to market volatility," National Bank of Ukraine (NBU) Governor Valery Gontareva told reporters in Kiev on Thursday. With foreign exchange reserves at only $7.5 billion, the central bank “is changing its approach to monetary policy, while strengthening its rigidity,” according to a statement published Thursday. 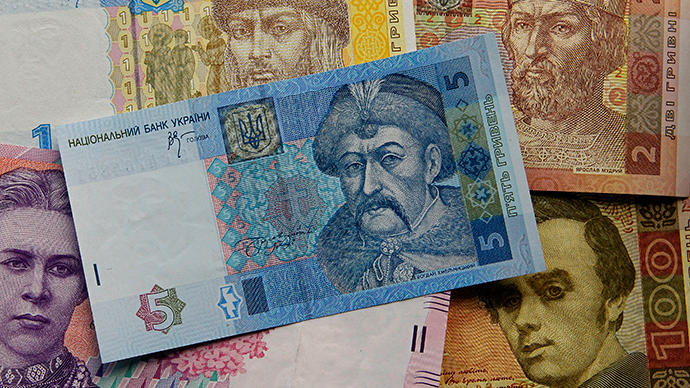 After the policy shift announcement, Ukraine’s hryvnia fell to 24.5 against the dollar and 28.092 against the euro. The bank also announced an unexpected interest rate hike to 19.5 percent from 14 percent, in a move to try and mend the worsening economic situation. Foreign exchange reserves are at a ten-year low of $7.5 billion, down more than 60 percent since last year. In December reserves stood at about $10 billion. "It's more about economic failings and the war situation at this stage. Interest rates won't make any difference just as they are not in Russia,” Simon Quijano Evans head of emerging markets research at Commerzbank in London, told Reuters. The National Bank of Ukraine (NBU) decided to scrap the indicative exchange rate on Monday. The NBU started $3 million currency auctions in November 2014 to establish the indicative rate serving as a benchmark for banks after the currency lost 50 percent against the dollar. As of February 5, the single exchange rate on the interbank currency market will be used, not the indicative exchange rate. However, the indicative rate and the real exchange rate in the market varied greatly. On January 30, the weighted average auction rate was 16.0072 UAH to the US dollar, but the market exchange rate was 21.10 UAH per dollar. All future currency auctions have been cancelled. US Secretary of State John Kerry is in Kiev today and may discuss further financial aid for Ukraine, an economy that not only suffers from a weak currency, but high debt and low foreign currency reserves. Meanwhile, the IMF might be getting cold feet in terms of providing Ukraine with more financial aid. The government in Kiev already secured a $17 billion aid package from the IMF last April, but only the first two tranches totaling $4.6 billion have so far been sent. The IMF is worried about Ukraine’s slow progress in putting economic and political reform into practice, as well as the over-bloated 2015 budget. The Central Bank expects the IMF to make a decision on the next tranche on either Friday or Saturday. Kiev has already received pledges from the EU to provide €1.8 billion ($2.05 billion) and an extra $1 billion in loan guarantees from the US, bringing Washington’s total Ukraine commitment to $2 billion.